My brother-in-law’s wedding. 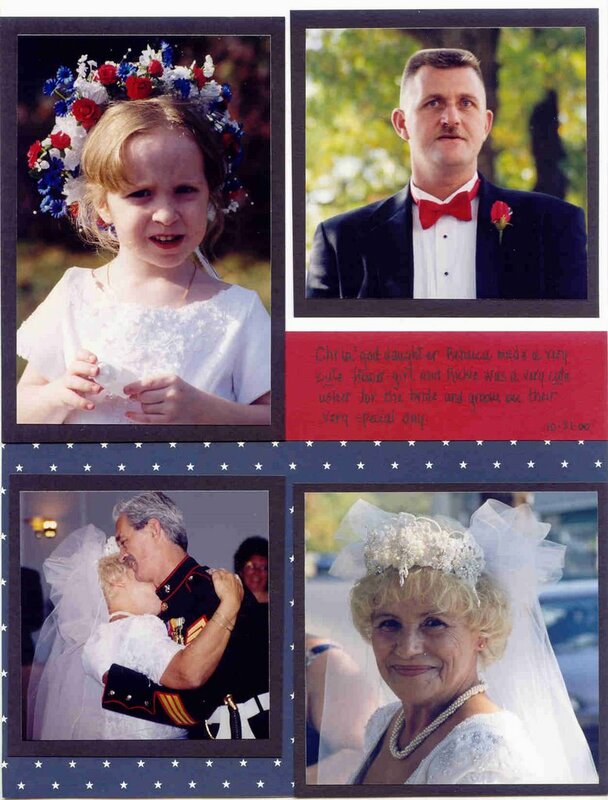 I scrapbooked a wedding album as a gift for them. 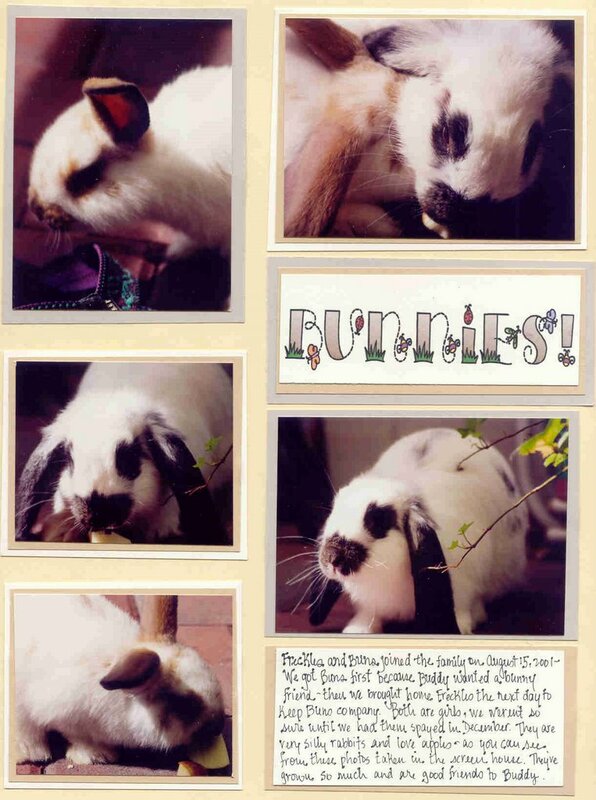 Naturwoman and I have been chatting a bit on her blog about scrapbooking, and we each wanted to have a look at the other’s pages, so I thought I would share a few here tonight. These are scanned and should be clickable for a closer look, if you dare. What I like best about scrapbooking is the storytelling aspect; picking a few of the best photos from an event and using them to give a sense of what happened. 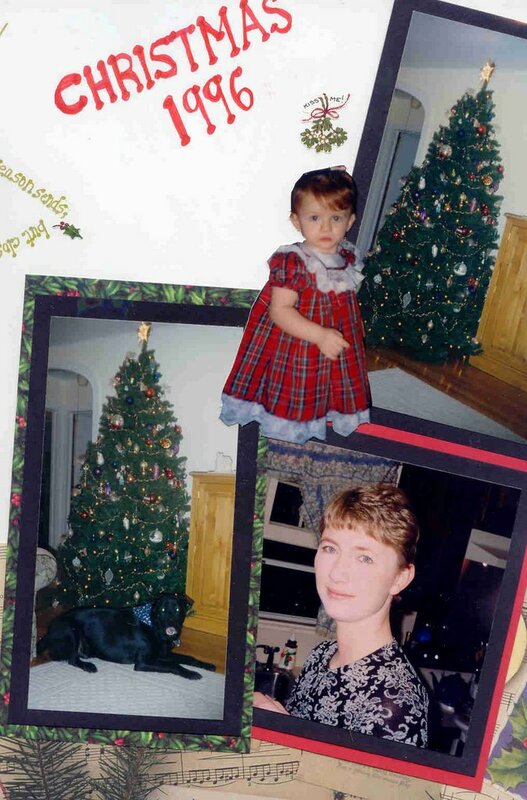 I never used to be such a shutterbug, so the prospect of scrapbooking my photos seemed reasonable. Nowadays, the idea is pretty daunting. 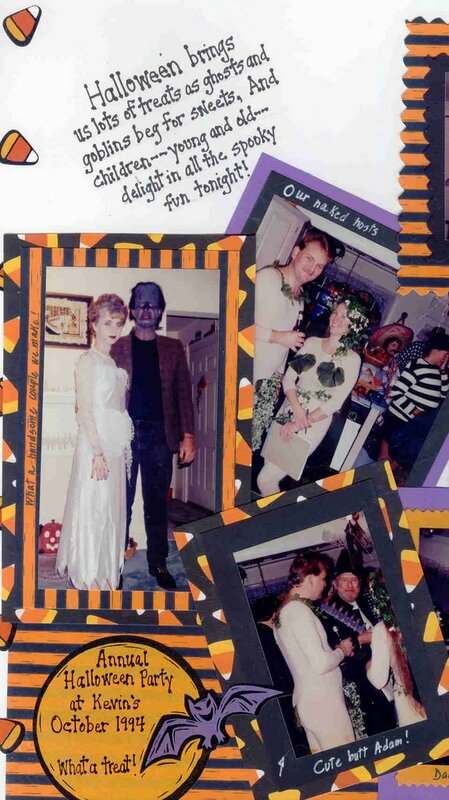 Scrapbooking has evolved to be a very complex craft; I’m not artistic enough or patient enough to do the types of pages I see in magazines today. I like to use pretty papers and stickers and play with colors and different styles of handwriting. For the first few years I made my pages for a 14″ X 14″ album, then I switched to a more standard size. Now I like to do little *books* – smaller page sizes are more fun and a bit easier to do. Now it’s your turn – let’s see some of those pages! 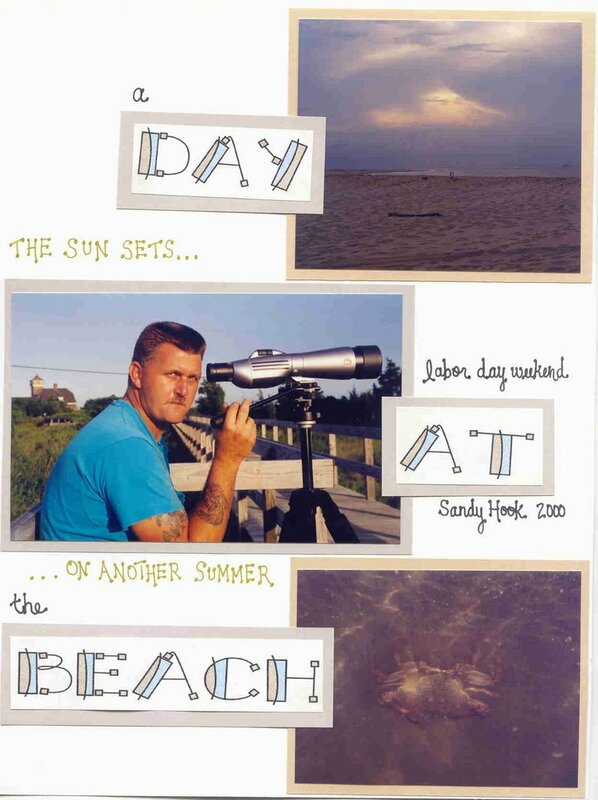 **Edited to add that Sandy at gardenpath has posted one of her pages – it’s really neat – have a look! Colorful flowers attract hummingbirds to the garden; nectar makes them hang around for a while. I only see hummers in my garden in late July and August, so I try to plant late-blooming flowers that they like. 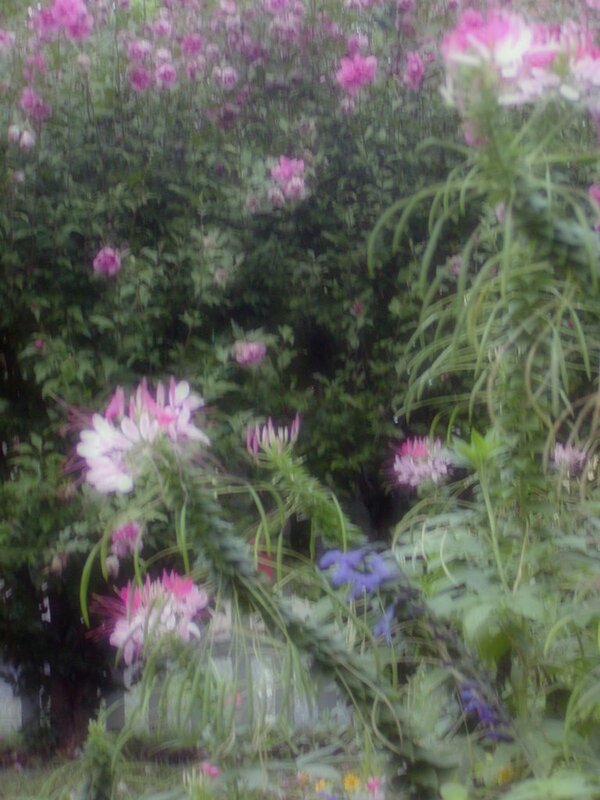 They visit the cleome, but I’m not sure that they provide any nectar. They especially like the black-and-blue salvias and some other salvias that aren’t visible in this pic. I expect the hummers to arrive shortly after the Rose of Sharon hedge begins to bloom; again I’m not sure if they’re able to feed from the flowers, but they do visit them often and like to perch in the hedge in sight of the feeders. I place my feeders in as shady a location as possible so that the sugar-water won’t ferment as quickly. 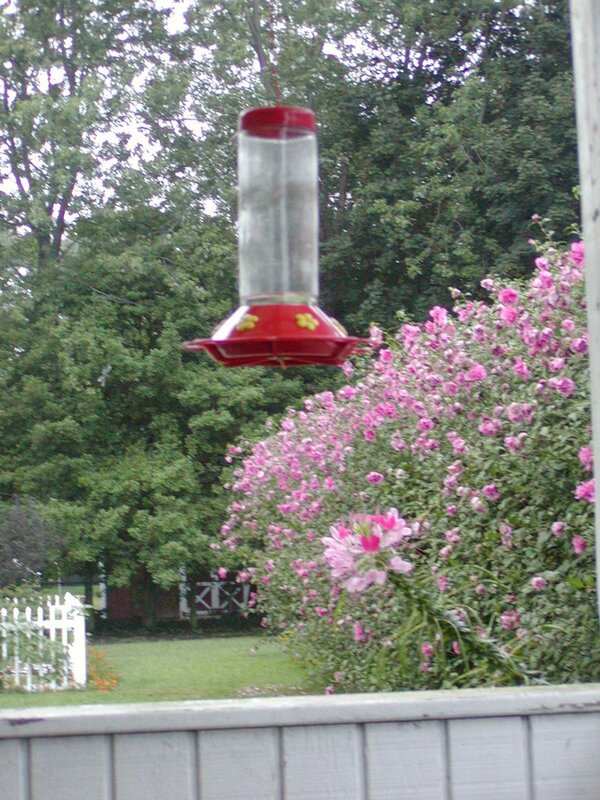 It’s important to maintain the feeder and change the solution at least every 2-3 days or anytime it looks cloudy. So as not to waste sugar, I only fill this feeder about a quarter of the way full – that’s more than enough for a day or two. Notice also that I don’t use red food coloring – it’s not needed so long as some part of the feeder is red to attract the birds. 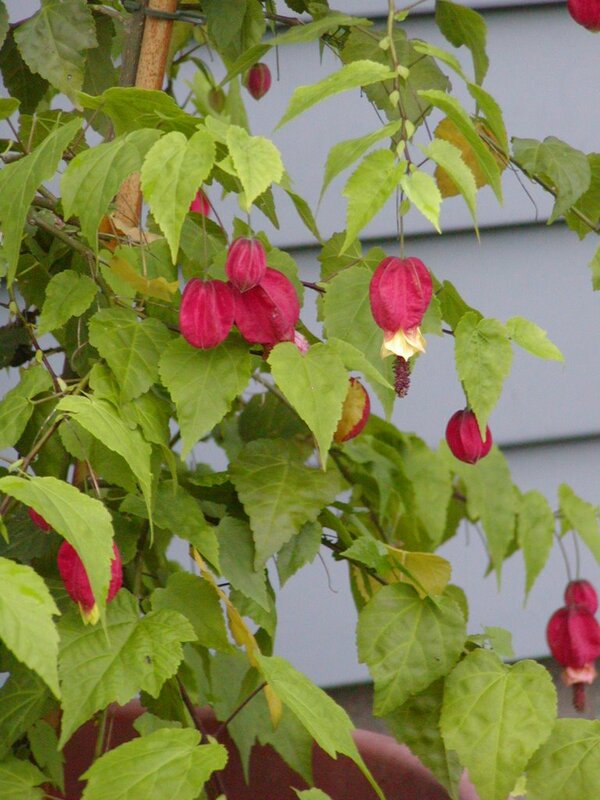 We have a variety of flowers that are pretty and attractive to hummers; flowering maples (Abutilon) are a favorite and come in many colors. My husband and I try to grow them all. 😉 We have them in purple, peach, yellow and red this year. The first hummingbird I ever saw was nectaring at a red blooming maple that we had trained as a small tree outside the bedroom window. These aren’t hardy for us in NJ, so we bring them inside each fall and try not to kill them. We usually fail. Killing stuff over the winter gives us an excuse to try something new the following summer. This flowering maple is a new one for us – it looks like the hummers might like it, but I’m not sure about the lantern-shaped flowers. I also grow pineapple sage for the hummers, but it usually blooms so late for me that the hummers are long gone when it finally comes into flower. I have a collection of pretty glass hummingbird feeders like these that are really beautiful to look at, but are a nightmare to keep clean. My husband can’t resisit buying me a pretty new feeder each year for my birthday, but he’s not the one in charge of cleaning and filling them! I hardly ever use these ones because the ants always find them before anyone else. 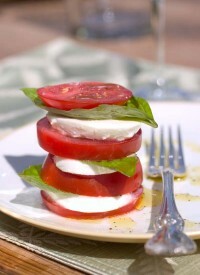 Is there anything sweeter than a Jersey tomato warm from the garden? Add just a little salt and pepper and you’ve served up perfection. My brothers and I used to eat them standing out in the garden, like an apple, when we were kids. Do NJ tomatoes have a reputation anywhere outside of NJ? I never got around to cooking a proper Sunday dinner tonight; having spent most of the afternoon in front of the televison, which I almost never do. Instead I put together a salad of fresh mozzarella, basil from the garden, and heirloom tomatoes that I picked up yesterday at the farmer’s market. Just a drizzle of dressing made it perfect and delicious! Michelle blogged today about tomato sandwiches (just add white bread, mayonaise, and salt+pepper) and Hanna at This Garden is Illegal has been blogging about fancy tomatoes for a week or so. It seems that many of us are rejoicing at the ripening of this good garden food. I’d love to hear your favorite way of eating a tomato. Share a recipe if you’d like. I have one that I’m eager to try – pasta, grape tomatoes, and goat cheese – sounds yummy! Bird’s nest is an alternate name for Queen Anne’s Lace, so called because of the way the stems rise upward to form a cup-shaped basket as the seed heads ripen, reminding some of a bird’s nest. The flower heads are flat-topped and as dainty as any fine lace; the foliage fine-cut and bright green. A single purple floret lies in the center of many, but not all, of the flowers. Some botanists believe that this central purple floret acts as decoy to attract insects to pollinate the flowers. It’s said that many insects will automatically be lured to the dark-colored flower and I’ve found crab spiders patiently waiting there for their next meal to arrive. If the crab spiders have come recently from yellow flowers they will be light yellow and adorned with faint pink markings. After a few days on the white lacy flowers they gradually turn white, also with pink markings, to match perfectly the white “umbrellas” with their purple centers, near to where they are waiting for their next victims’ arrival. 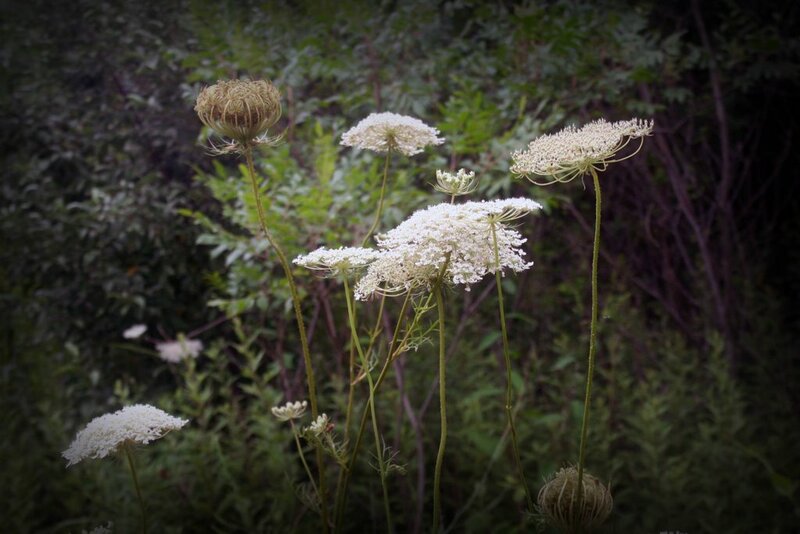 These pics were taken in the meadow at Deep Cut Gardens, but Queen Anne’s Lace can be found now along many a roadside. I’ll sometimes grow it in pots at home, afraid to set it loose in any of the gardens because it reseeds so freely. 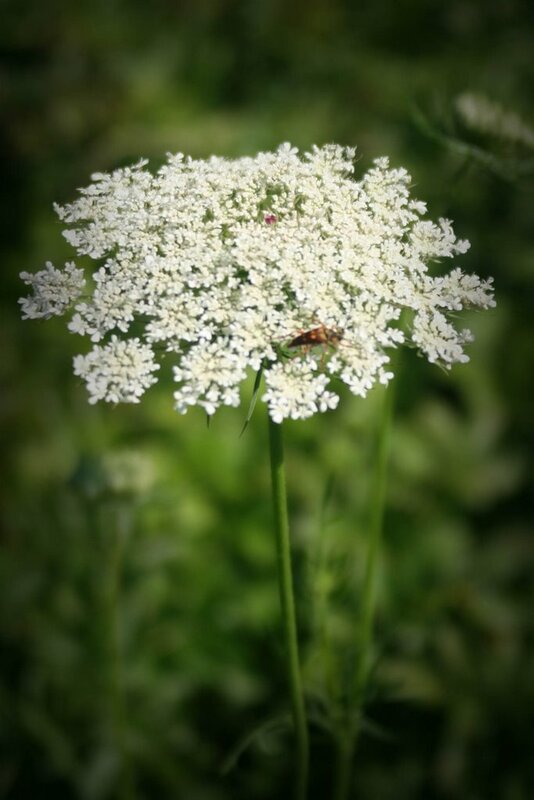 Queen Anne’s Lace has quite a few lookalikes, many of them deadly poisonous, so be very careful of sampling the root of any plant you suspect to be this wild carrot. What a difference a day makes! On my way out the door to work this morning I detoured to check the progress of the monarch caterpillar and discovered it still dangling upside down, deciding how to get rid of its skin. 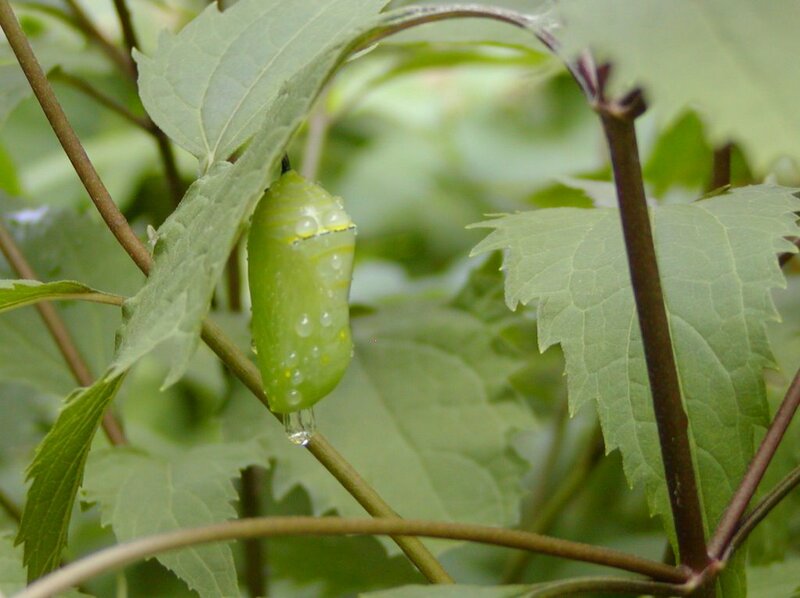 When I returned late this afternoon, I found the caterpillar had redressed itself in this beautiful chrysalis! 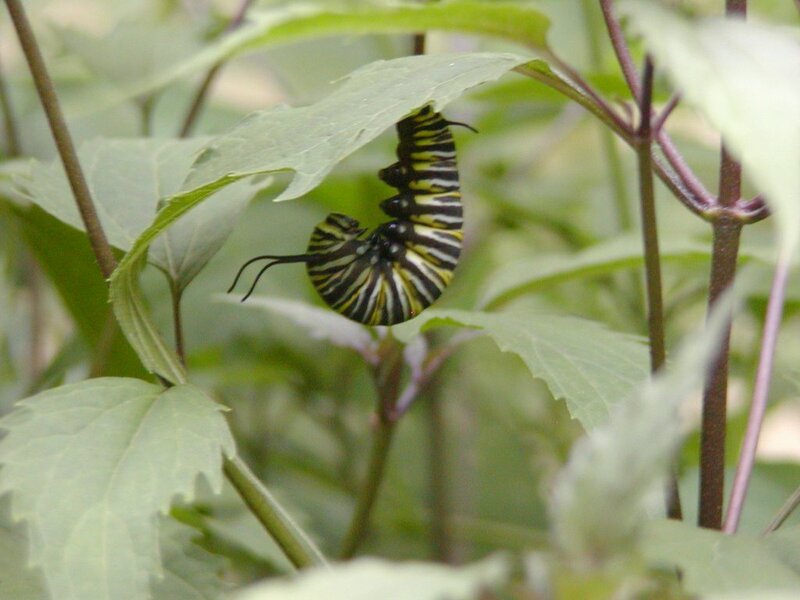 Look what I found this evening in the milkweed patch! I’ve been searching all summer long for monarch eggs or caterpillars, suffering monarch envy at the project Bev at Burning Silo has going on, and had about given up on finding any this season. I’m so tickled to have spotted this! I’m guessing the caterpillar will make its chrysalis on the underside of this snakeroot leaf. I’ve never come upon a monarch caterpillar in this state before; they always go missing just when they get big and fat, but according to what I’ve read on the Monarch Watch website the caterpillars wander until they find a suitable site and then form this “prepupal J” before shedding their skin for the final time. I’m hoping that in the morning I’ll find a beautiful chrysalis in just this spot. 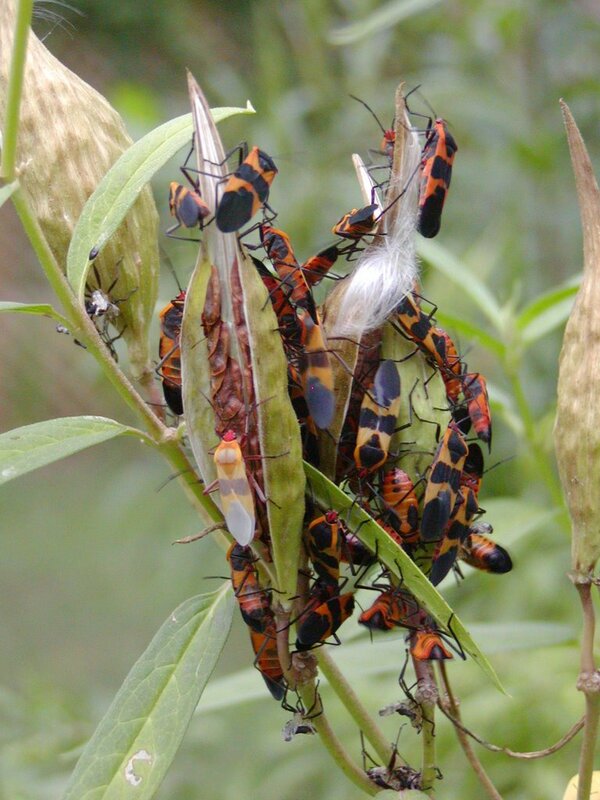 I’ve been amusing myself the past few weeks by watching the development of the many groups of milkw eed bugs that are feeding on the Swamp Milkweed seed pods. Yesterday I found that many in this group were in the process of shedding their skins to adulthood. Other seed pods have bugs in various stages of development and in the last few days I’ve found many of the very tiny ones that I had at first thought were aphids. I thought the pic at right was interesting because you can see one bug (almost in the center of the pic) who still looks somewhat transparent. I don’t know whether the black coloration is in the wings or on the body itself, but this one’s wings are clear and it’s very light orange compared to the others. Upwards to the left of that bug and below to the right are the shed skins of others. Not the greatest of pics… I apologize. Click on the photo to enlarge and you may actually be able to see what I’m talking about! Maybe, just maybe, I’ve finally found a bunny that will pose for pictures, rather than running underneath the nearest piece of furniture when the camera comes out. Peeper likes to sit beside the window on my hope chest and that’s where I took this pic today. The afternoon light streaming in the window does wonderful things for her brown fur, don’t you think? It’s almost two months now since Peeper *showed up on the doorstep* with the help of a kindly neighbor. Just about a month since she was spayed. The change in her personality has been quite dramatic in that short period of time. She no longer peeps at me like a little lost bird; she doesn’t often have reason to be frightened now. For a while she would peep and growl at the vacuum cleaner, but now she just boxes at it if I get too close while cleaning her cage. She doesn’t peep when I touch her, but is frightened when she thinks I might pick her up. She’s learning to like being petted and loves to explore in the evenings when she’s out. I’ve had to set up an x-pen to confine her to the office and hallway, otherwise I’m sure she’d take run of the house. With Dora, who used to live here in the office, I never had to set up a gate at the doorway because she would not cross the threshold; Peeper has no such fear and a moment of inattention on my part found her down the hallway in our bedroom, under the bed. She’s a very unassuming rabbit; a lot like Freckles. Very quiet though; she hasn’t learned to throw things the way Freckles likes to do. She’s happy sleeping the days away, eating greens, hay and the occasional baby carrot I hide for her somewhere, and exploring and contemplating by the window in the evenings. One at a time I’m introducing her to the treats that most house bunnies love. Most she likes and will grab from my fingers and run away with. Last week I gave her a small piece of what had to have been her *first ever* banana. 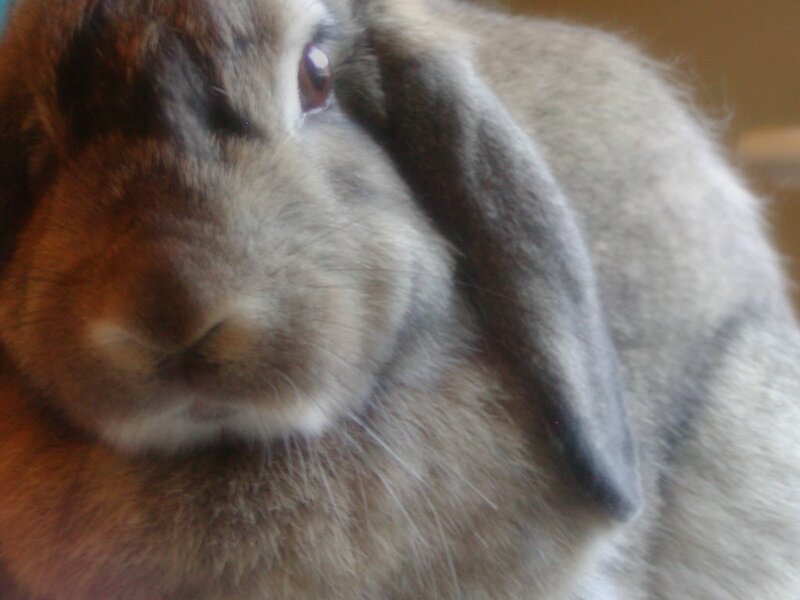 Most bunnies love bananas. Not Peeper… not yet. 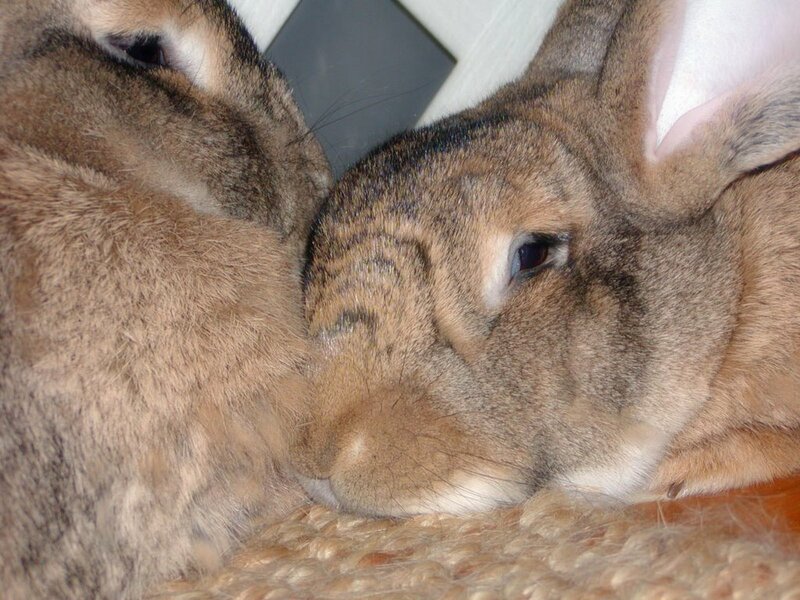 She curled up her lips and backed away suspiciously… then she ran and thumped at me. Silly rabbit, not liking nanners! This is not the greatest of pics, but our Angel Trumpets aren’t much to look at this year. The trees are spindly and the leaves are a sickly shade of unhappy green. Now, at the end of the season, we have our first three flowers. 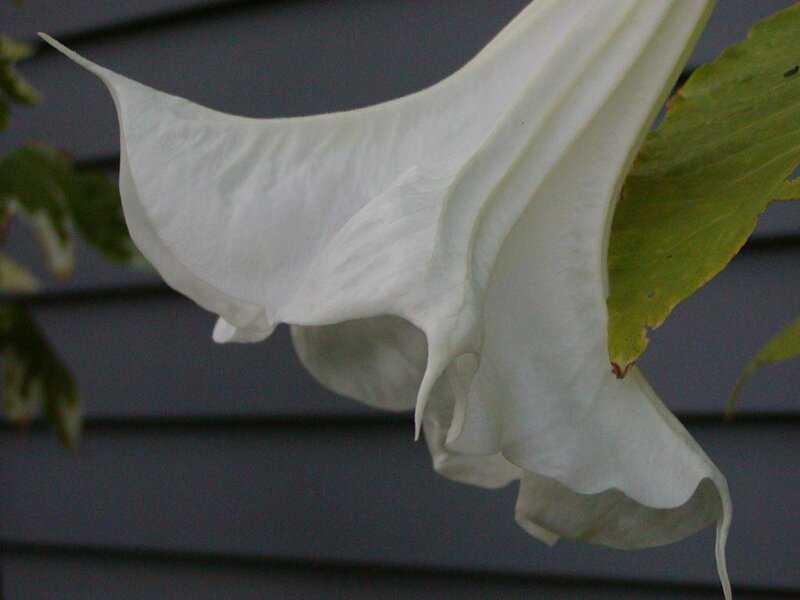 I was hoping to show you how the flower shape of the Angel Trumpet is the same as the moonflower, only these trumpets hang downward and unfurl in the same pretty way. The flowers last a bit longer than the moonflowers, as well. There is a bit of confusion among the common names of these plants with trumpet-shaped flowers. I’m as confused as anyone. We call White Daturas *moonflowers*, but the link I provided in my first post about them was to another plant commonly called a moonflower which is in the morning glory family. Pam, who lives in the desert, mentioned in her comment to yesterday’s post that Daturas grow there, but not moonflowers. So, I’m guessing she’s refering to Purple Daturas, of Jimson Weed fame. I guess it’s the same plant, but with a different colored flower. Both have the spiney, thorn-covered seed balls that give them their other common name, Thorn Apples. The purples do not make a nice garden plant, in my opinion, and are very weedy looking. Angel Trumpets are Brugmansias, I think. I’m afraid to be too certain. Is everyone confused yet? The rule my DH and I follow is that if the flowers point up to the moon we call it a *moonflower* and if they point downward it’s an Angel Trumpet. Works for us! In good years, we have a few plants in large tubs that look like this one, courtesy of Birds and Blooms. Isn’t it fantastic! My father-in-law grew the most spectacular Angel Trumpets and his yard was filled with them. Quite a sight! Somewhere in the attic I have a copy of an article the local paper did about him and his flowers. The local ABC news affiliate picked up the story and interviewed him – that was something to see my in-laws on television. Wish I could have put my hands on the article to post here tonight. 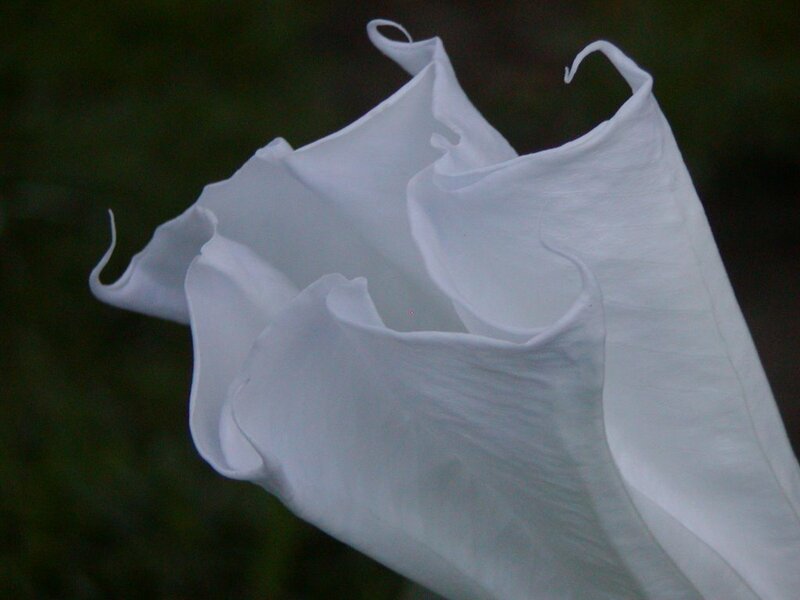 Watching the swallows and swifts this evening while I watered the garden, and waiting for the appearance of the bats overhead as my signal to go inside, I reached down to turn off the well pump and got a whiff of this moonflower – wow! 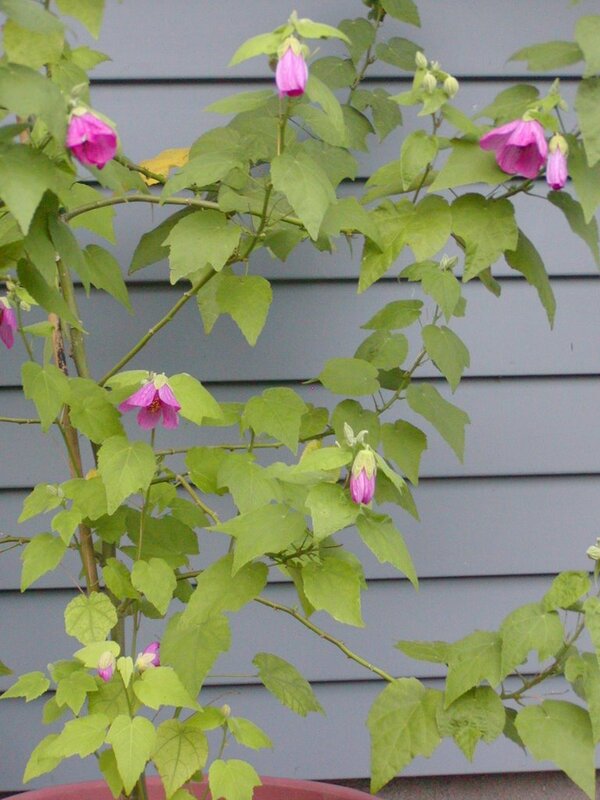 Most of them are planted along the fence surrounding the pond, intermixed with day-blooming morning glories, but a few are in pots up beside the house, where on humid nights their lemony scent drifts in the windows. The smell can be overpowering enough to give me a headache, especially if we also have Angel’s Trumpets blooming. I loved the shape of this flower as it unfurled. Some cultural info about moonflowers is available in this blog post from 6/8/06.